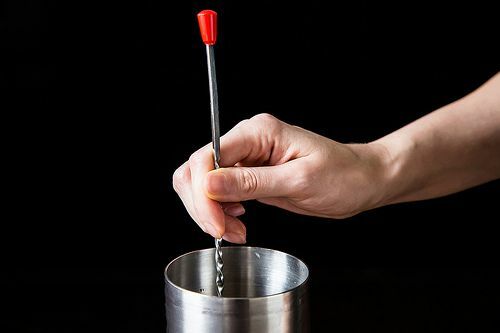 Today: We’re stirring up the most classic cocktail of all. In the 50s, martinis were what Mom and Dad sipped before a dinner of meatloaf, garden salad, and creamed corn. Not anymore, of course. 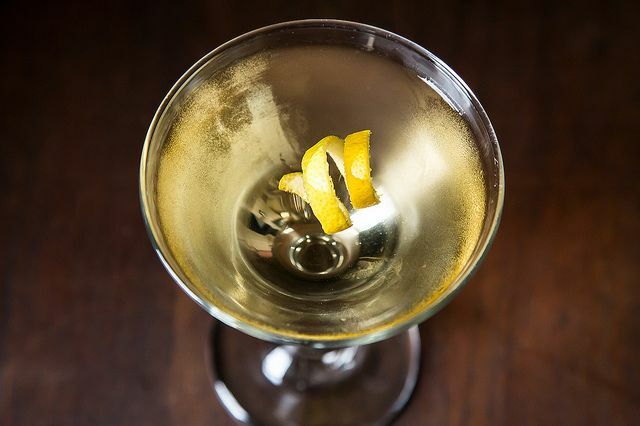 Cocktails have made an extraordinary comeback and the martini is undoubtedly leading the charge. It has a clean, bracing taste, and we won’t lie -- drinking one just makes you look classy. Where was the cocktail born? The most referenced story in the history books is that it all started in the 1860s with a cocktail called a Martinez -- made of gin, sweet vermouth, bitters and maraschino liqueur. Recipes evolved from there, but the martini pioneer is still largely unknown: “It’s kind of like asking who made the first airplane,” cocktail author Barnaby Conrad said in one interview. • Never freeze your alcohol -- the ice you use during stirring not only chills the liquid down efficiently, but it infuses it with enough water to temper the alcohol burn. Water is an essential component of a well-mixed martini. • Feel free to play with the vermouth ratio a bit according to your own palate. • Many classic recipes call for orange bitters -- I like a few drops for extra complexity, and if you make yours this way, invite me over. But only two at the most. Four I’m under the host. 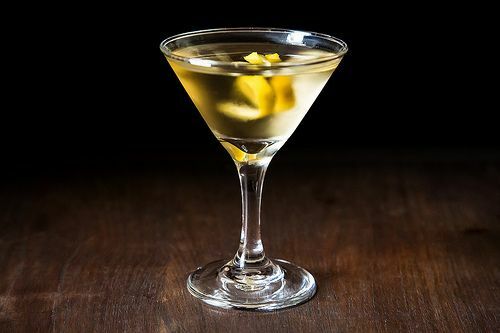 My mother and father taught me to make martinis very, very dry, which meant that there was a dusty old bottle of vermouth in the back of the liqueur cabinet. The martini was made with good vodka, stirred with ice, strained into a chilled martini glass, with an olive, and the only presence of vermouth was that it remained unseen in the liqueur cabinet gathering more dust. Thanks to the Valentine's Day menu suggestion, I made martini's for the first time on Valentine's night (why did I ever wait so long?!). Made one as here, the 2:1 ratio, and the other 4:1, both with a twist. Absolutely delicious no matter what, but the husband loved the 2:1 and I the 4:1. Totally Jack Sprat and his wife; happiness all around, which seems indeed to signify the importance of individual preference. We drank them while catching up on Downtown Abbey - this is crazy romance with two small children sleeping nearby! haha, Downton Abbey and downing martinis. I like your style JadeTree! Well, I like a Viper Martini, the original 007 recipe is equal parts gin and vodka, a cap of Lillet, our into ice and stir, stir, stir....and two olives and one onion. Because all our friends want at least one martini this recipe is perfect when made in a pitcher. Do not forget to remove the ice. Wow, haven't heard of this version, will need to try. I'm fully behind a dash or two of orange bitters. But I'll so a 2:1 gin:vermouth ratio makes for a pretty wet martini. For me, 4:1 is the right recipe. I must have had too much gin. I have no idea what "I'll so" was supposed to mean. ha ha - I finished it as "I'll so bet a 2:1 gin:vermouth ratio ... " My ratios are on a sliding scale based on the kind of day I had. To kick it up a notch, try to find a bottle of Dolin Vermouth de Chambery....using this brand of vermouth is akin to leaving college jug wine behind for a really wonderful small vineyard red. I am a Martini, straight up with an olive drinker. I have given up ordering them in many foreign countries because as soon as you say "martini" they only know about Martini and Rossi vermouth! I'm actually quite fond of Tomolives in my martinis so as to confine the majority of my caloric intake to the alcohol. The Tomolives pack quite a punch and are also quite fun in Bloody Marys and Bloody Marias. Um, the Wright Brothers made the first airplane. So it's not "kind of like asking" that. Let's all be friendly in the name of the Martini! We can probably both drink to that. Actually, if you'd like to mince words, I think the Wright brothers made the first controlled, sustained flight in an airplane. I don't think they built the very first airplane.